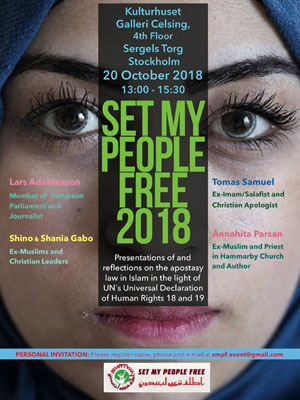 Set My People Free 2018 will be held in downtown Stockholm on 20 October. SMPF will remember the victims of Islamic apostasy and blasphemy laws, create awareness about these laws and the impact they have and how they restrict freedom of expression and freedom of thought, conscience and belief. The location is the House of Culture (Kulturhuset), Galleri Celsing, 4th Floor, Sergels Torg, Stockholm. We are inviting politicians, journalists and human rights organisations. Different victims of apostasy and blasphemy laws will be there to share their testimonies. 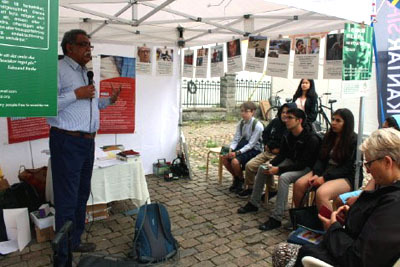 Almedalen Week is when different Swedish parties come together to present their programmes, normally attended by around 40,000 people. This year they are expecting even larger crowds as it is the year of the election and also it is the 50th year anniversary of the event. Set My People Free will be holding 10 seminars 1-5 July. (six near our tent, and four in the Speakers Corner). These seminars are advertised in the official program of Almedalen Week. 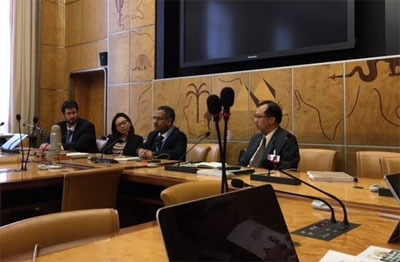 Two lawyers from Malaysia, Eugene Yapp and Gayle Joking, participated and did an excellent job at bringing up issues of concern, together with Dr. Ahmed Shaheed, the UN Special Rapporteur on Freedom of Religion and Belief. During our time in the Human Rights Council we had opportunity to attend about seven other events and bring up the problem of islamic apostasy and blasphemy laws and the way it violates religious freedom. We distributed over 500 map-cards and around 150 of the booklet Victims of Islamic Apostasy and Blasphemy Laws. Almedalen Week is an annual event taking place in and around Almedalen, a park in the city of Visby on the Swedish island Gotland. It is considered to be the most important forum in Swedish politics. 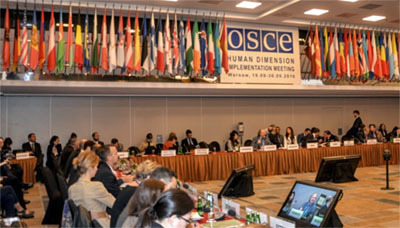 The OSCE Human Dimension Implementation Meeting (HDIM) is the worlds largest annual human rights conference. This year it convened again in Warsaw for 10 days. 1336 participants, 460 NGOs, 57 government delegations from the OSCE region met. HDIM has brought together hundreds of government officials, international experts and human rights activists i.o. to take stock of how states are implementing their commitments in the human dimension - in other words, the core values that promote respect for human rights and fundamental freedoms. In partnership with the Forum for Religious Freedom Europe (FOREF), Set My People Free (SMPF) will present an Open letter to different countries that criminalise apostasy and blasphemy laws urging them to implement article 18 and 19 of the Universal Declaration of Human Rights. We will try to contact 10 different countries which criminalise death penalty and seven countries where it is illegal to change religion. Set My People Free will be in Almedalen between 4-9 of July, as we are going to have a stall there. We will present some seminars about freedom of speech, freedom of thought conscience and religion and apostasy and blasphemy laws in Islam, show video clips and give out pamphlets like the Map card and a magazine. Almedalen Week is an annual event taking place in and around Almedalen, a park in the city of Visby on the Swedish island Gotland. It is considered to be the most important forum in Swedish politics. During the week, representatives from the major political parties in Sweden take turns to make speeches in Almedalen. 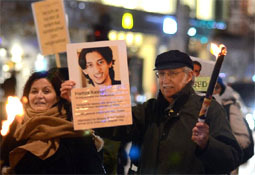 Organisers displayed photos of victims of apostasy in Saudi Arabia, Iran, Sudan, Pakistan and Egypt. The manifestation began with a sht opening speech by lawyer Anders Svensson, who MC'd the event. The main speaker was Mona Walter, who is a civil rights activist for gender equalities and for freedom to change belief. Mona spoke about freedom of speech and the importance of religious freedom stating that without the freedom to change belief there is no religious freedom, and the individual should not be killed for leaving Islam. She gave examples of Asia Bibi in Pakistan and Meriam from North Sudan. Mona is a board member in Set My People Free and a former muslim from a Somali background. Wilgot Fritzon was the second speaker. He is a former board member of Set My People Free and one of the founders. He spoke about three individuals who are in prison due to apostasy and blasphemy laws: Asia Bibi in Pakistan, Raif Badawi in Saudi Arabia and Bahnan Irani in Iran. A couple of hundred people from Rinkeby and people interested in freedom of speech from Stockholm attended the meeting. Interesting discussions were going on during and after the manifestation about freedom of speech, the right to change belief, and democracy. The event drew media attention. The Swedish TV (SVT) & Radio (Somali Radio in Sweden) and some major newspapers reported about the event. A large number of people shared the event on social media. Many activists posted photos and clips from the event. A clip from Mona's speech was watched by 20,000 people. Over 3,500 people checked our Facebook page in less than a week. The SVT clip was shared over 2,000 times on Facebook. The police did a civilised, democratic and professional job to make the event possible. The Manifestation was organised by Set My People Free Sweden to protest against apostasy and blasphemy laws in Islam and to stand up for religious freedom and freedom of speech. Around 25 people participated in this manifestation held in Solna, a suburb of Stockholm. 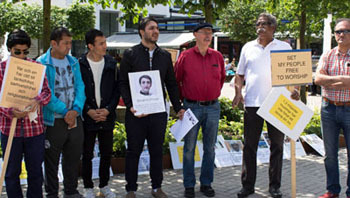 With display of photos of victims of apostasy and blasphemy laws, we stood in Solna Centrum giving out around 500 pamphlets and creating awareness. The participants in the manifestation exchanged talks with the public about the issue. 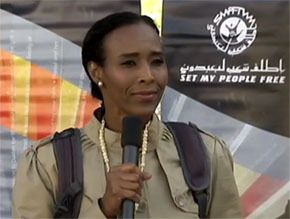 Mona Walter, a Somali human right activist, Miss Flour, an Iranian Evangelist and Kamal Fahmi, the International Director of Set My People Free, spoke on the issue. The display and manifestation continued for two and a half hours. See article (in Swedish). 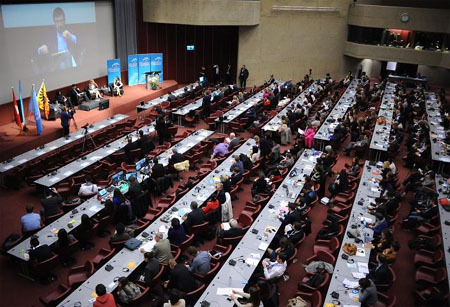 The Geneva Summit for Human Rights and Democracy assembles each year hundreds of courageous dissidents and human rights victims, activists, diplomats, journalists and student leaders to shine a spotlight on urgent human rights situations that require global attention. The Summit is sponsored by a coalition of 20 human rights NGOs from around the world. This annual conference builds on the success and momentum of the previous gatherings, which have been widely acclaimed in the international human rights community. 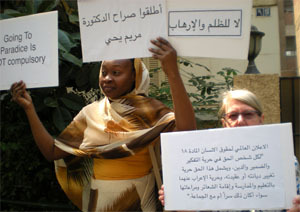 Held in front of the Sudanese Embassy in Cairo, Egypt. Ten people participated in the protest, five of which were converts from Islam. The protest had an impact on the Embassy staff and its visitors despite its small number. At the end they handed over a letter to the Sudanese Ambassador. The Embassy called the anti-demonstration police for protection and to disperse them. The protesters were able to stand in front of the Embassy for about half an hour. Naghmeh Abedini is asking people to stage a peaceful demonstration in front of Iranian Embassies and consulates worldwide. 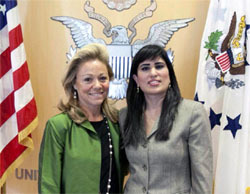 Naghmeh is the wife of Saeed Abedini who was arrested last year in Iran and sentenced to eight years in prison. From Naghmeh Abedini: My name is Naghmeh Abedini , I am the wife of Saeed Abedini who is an American pastor who has been sentenced to eight years in Iranian prison (Evin prison). I have been on CNN, Fox News, USA today, BBC Farsi, VOA Persian and many many other media advocating for my husband's release from Evin prison. 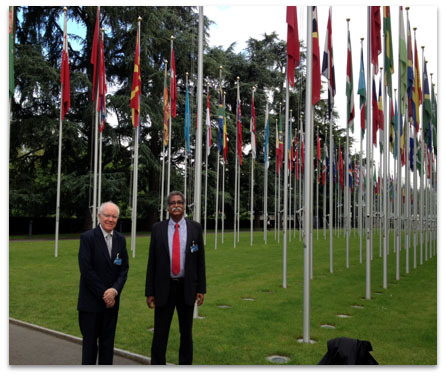 I have spoken before USA congress and will be speaking in front of the UN in Geneva on June 3, 2013. I write you today to request your help organizing and carrying out a single day of peaceful demonstrations at Iranian embassies and missions around the world to demonstrate against the unlawful arrest and degrading treatment of the many Iranian prisoners of conscience, including and especially those in Evin Prison and Pastor Saeed Abedini who has been tortured and abused for him to deny his Christian faith. I ask you to do what you can to bring awareness to this day of demonstration in from of all Iranian embassies one day before the Iranian election. There is power in unity. Who Will Stand Up for Religious Freedom? The event will provide A Practical Exposition of the October 2012 Interim Report of the Special Rapportuer on the Freedom Of Religion Or Belief on the Elimination of all forms of Religious Intolerance. Furthermore it is intended to provide practical examples of current legal frameworks which hinder the exercise of Article 18 rights, namely blasphemy, apostasy, and anti-conversion laws. The panelists will discuss how these laws both violate international human rights principles and create impunity for incitement to violence, weakening the rule of law, destabilizing communities and increasing the likelihood and severity of sectarian violence. Panelists will also discuss the proper construction and enforcement of incitement laws, which will protect Article 18 Rights, and end impunity for incitement to violence in accordance with international standards. See more information at links below. On 7 November 2012 Set My People Free joined with the Swedish Evangelical Alliance, Open Doors, Light of the East and St Klara Church and a number of churches in Stockholm in a Manifestation. Set My People Free got the permission for the Manifestation from the police focusing on the persecution of Christians in countries that violate the UN Convention on human rights and freedom of religion, freedom of expression and freedom of conversion. Around 300 joined the Manifestation. More than half of them were converts from Islam to Christianity, mostly from Iran and Afghanistan. With great emphasis on the application of article 18 of the UN Universal Declaration on Human rights especially in the speeches in Sergels torg. The day started by an event hosted in the Parliament by the parliamentarian Annelie Enochsson on Religious freedom and persecution of Christians. The following people participated in the Panel, Katherine Cash, Thomas Schirrmacher, Soheila Fors, Nasrin Sjögren, Gabriel Donner, Katarina Tracz. The report by the UN Special Rapporteur on freedom of religion or belief Heiner Bielefeldt was handed out during that session. This was followed by the Light Manifestation, in which the participants carried banners saying: Give Muslims freedom to covert! Stop apostasy law! Apply article 18 of the UN declaration of Human rights! Stop torture! Stop anti-conversion law! Participants also carried photos of Muslim converts who are in prison or being persecuted for their faith in Christ or for their freedom of thought and conscience. The Manifestation was followed by a public meeting in Sergels torg. MC'd by a former TV journalist, Siewert Oholm, where Annelie Enochson, Kamal Fahmi and Roksan Parsan gave speeches. "We are here to remember the victims if Islam Apostasy and Blasphemy laws. We are here to see a change in their situation. We are here that they may have freedom. We are here that they may have equal rights." Read more of Kamal's speech. The day ended by a church service hosted by St:a Klara Church with the emphasis on Religious freedom. Keynote speakers were Fuad Rasho, Thomas Schirrmacher, Annahita Parsan and Stefan Attefall led by Wilgot Fritzon. The service ended by a time of prayer led by Nils LIdskog.